When you’re part of a giant franchise, there are going to be toys of you. That’s just how these things tend to work. Star Wars is in a realm all of its own, with toys ranging from giant Star Destroyer LEGO sets to Elan Sleazebaggano action figures, and, naturally, the stars of the franchise have their favorites and least-favorites. Mark Hamill recently shared his opinion on what he thinks is the worst Luke Skywalker toy, and it’s quite a doozy. 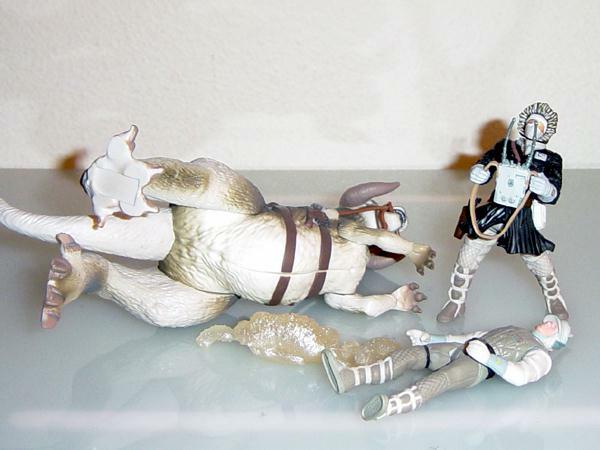 When a fan tweeted their question at Hamill, he immediately had an answer in mind: a particular action figure set that included a dead Tauntaun from which you could extract a small figure of Luke, based on that scene in The Empire Strikes Back. Yikes. The toy in question was released in 1982 and featured Han Solo, an unfortunate Luke, and a Tauntaun with a soft open rubber belly. Just typing that last part feels gross. The scene is pretty horrifying in the movie, especially, I'd imagine, for the children who were supposed to be buying these toys, so it’s pretty weird that they’d decide to make this. Then again, maybe there are some kids out there who want to get really realistic with their Star Wars games. At least this one didn’t include the gross intestinal bits. Hasbro’s version did.